How to describe the indescribable? Or at least the prohibited? It’s the kind of literary googly you’d expect Severus Snape to keep up his sleeve for flummoxing uppity young wizards. But with handout badges requesting audience members – and tormentingly reviewers – to #KeepTheSecrets, only a muddle-headed Muggle or the evil Lord Voldemort would risk the wrath of JK Rowling by revealing the plot of Harry Potter and the Cursed Child, the eighth volume in the world’s most successful series of children’s fiction and the first to find itself realised on stage. The show, weighing in at $68.5 million (that’s nearly $90 million AUD!) required a complete refit of the Lyric, one of Broadway’s largest theatres, and from the moment you enter the foyer the results are breath-taking. From the wine-dark Hogwarts-themed interior panelling and dragon wall lamps to a vaulted roof and ‘H’ monogrammed carpets, the design team has created a magical space that can light up and wrap its arms around an audience at key moments. And to judge from the compelling storytelling, the thrillingly inventive staging and the ecstatic response of the Sunday afternoon and evening crowd, this is a show that will run and run. So, what can be revealed? First of all, it’s important to know a bit about the books because if you haven’t genned up you will be lost. 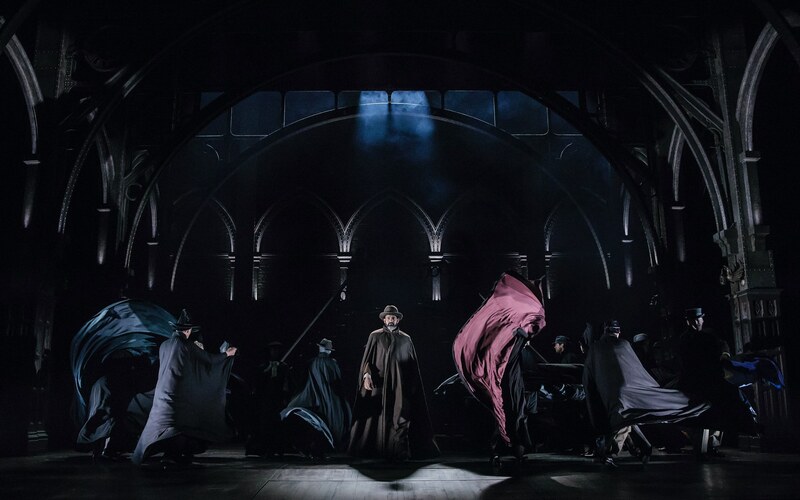 There are plenty of online websites offering potted synopses, but be careful with your googling as the Dark Lord’s minions have left Cursed Child spoilers everywhere to trip up the careless surfer. Once you have the basics of the first seven volumes and you can tell a Time-Turner from the Triwizard Tournament, skip forward 19 years from Harry Potter and the Deathly Hallows and you’re off. Harry is now 37, and with wife Ginny (née Weasley) has two sons and a daughter: keen-as-mustard James, hyperactive Lily and introverted Albus Severus, so named for Harry’s twin role models, Albus Dummbledore and Severus Snape. As his parents prepare him to board the Hogwarts Express, the sensitive Albus feels acutely the pressure to make the right friends, get into the right House and live up to his father’s complicated reputation. Also at the station are Hermione Granger and her husband Ron Weasley seeing off daughter Rose (clearly a chip off the old overachieving Granger block) as well as Harry’s former nemesis Draco Malfoy and son Scorpius, an awkward lad with a suspect past whose clumsy and over-compensating sense of humour seem destined to win him few friends. 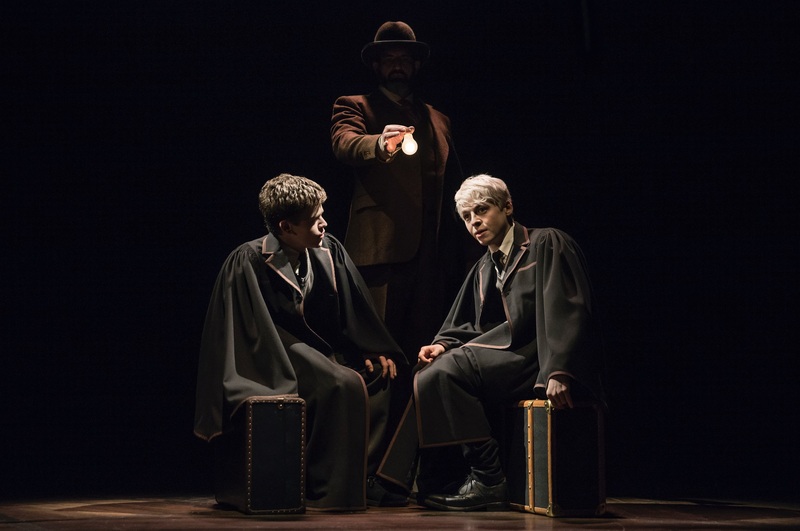 Adolescent angst and father-son relationships will obviously play as vital a part in Cursed Child as they did in the novels, but with the added complexities of Harry’s own tortured familial history. Clearly young Albus will have one hell of a job finding his own place in the universe. For all its magic and mayhem, at the heart of the play lie universal themes of friendship, loyalty, trust and the old truism that history has a habit of repeating itself. On the latter point, through a neat piece of temporal trickery we are granted a kaleidoscopic series of ‘what ifs’, ensuring a typical Rowling plot of increasingly labyrinthine complexity. It also neatly allows us to encounter favourite characters from the past, present and future, much to the delight of audience members who greet each old friend with a healthy round of applause, even if all they’ve seen is a fleeting profile or the rear view of a familiar head of hair. Of course, none of this would count for much if it wasn’t for the quality of the storytelling and the script, both of which are first rate. The play, by Jack Thorne (Let The Right One In), is based on an original story by Rowling, Thorne himself and director John Tiffany (Once, Black Watch). It’s a fast-paced Rubik’s cube type affair with the kind of reveals that make Potter aficionados gasp out loud. Best of all, by coming in two substantial parts, it takes the time to linger on the personal and profound – in other words, where it matters most. Honestly, the five-plus hours fly by faster than a souped-up game of Quidditch. Tiffany’s marvellously inventive staging takes place inside (even sometimes outside) Christine Jones’s commanding, darkly vaulted space, stunningly lit by Neil Austin’s intricate and detailed lighting design. The permanent shadowy gloom behind the action adds to the atmosphere while enabling a great deal of hocus-pocus – illusions and magic by Jamie Harrison – that regularly has you turning to your neighbour with your “how did they do that?” face on. Imogen Heap’s poppy music may not be as distinctive as the film scores, but it keeps things on their toes while Steven Hoggett’s dynamic and resourceful movement does the rest, from hyper schoolkids playing at spells to swirling convocations of wizards, spinning staircases and revolving train carriages. And what a cast – all 40 or so of them, including covers! Seven of the original acclaimed London actors are involved on Broadway, but to be honest there isn’t a weak link here. Jamie Parker’s Harry is a convincingly conflicted bundle of paternal insecurities and unresolved issues. Having never known his own father, he’s convincingly at sea with his own problem child when the going gets tough, never quite realising they are two peas in the proverbial pod. 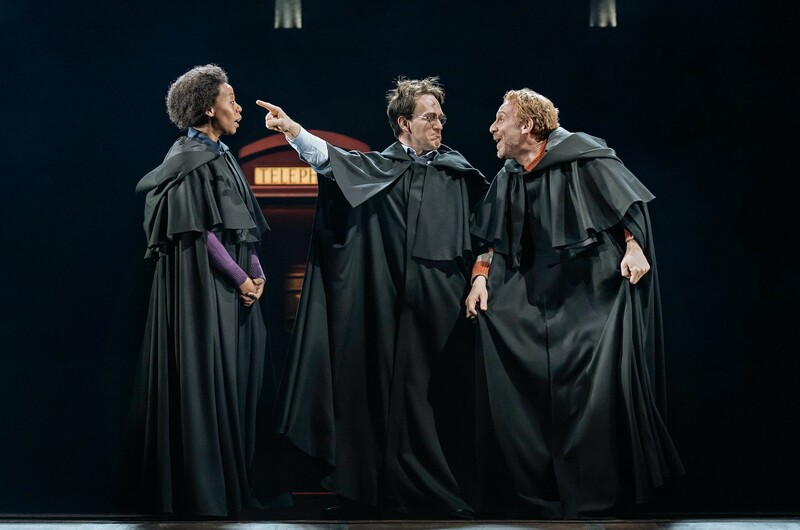 Sam Clemmett captures Albus’s mounting insecurities to a tee and makes a most persuasive adolescent, despite being twice as old as his character. It’s a touching and sometimes painful performance, especially his scenes with Anthony Boyle’s equally tormented Scorpius Malfoy, a standout performance that crosses Richard III with Rik Mayall and an added dash of Boris Johnson. 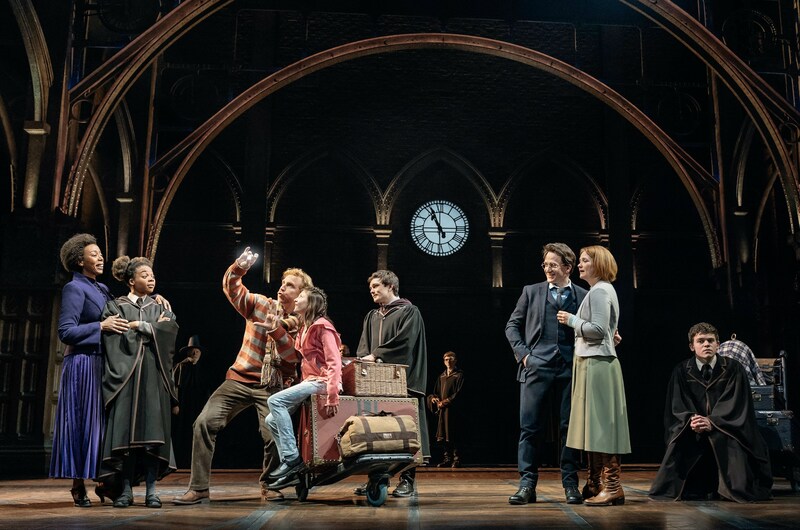 Harry Potter and the Cursed Child won a remarkable nine Olivier Awards, including Best Play, Best Director and acting awards for Parker, Dumezweni and Boylemore. It also gleaned more five-star reviews than you could shake a wizard’s wand at. For sheer theatrical magic, it’s easy to see why, but it’s also a play with great heart and many lessons to teach. As such, it is guaranteed to keep anyone engrossed, no matter how young or old. The Broadway run is mostly sold out through to next March (though there are various schemes including a Friday release of low-cost tickets). However, the show’s transfer to Melbourne’s Potter-renovated Princess Theatre in early 2019 is assured, and on this showing, I’d say last one in the ticket line’s a Muggle. Harry Potter and the Cursed Child is at the Lyric, 43rd Street, New York for the foreseeable future. It opens in Melbourne in 2019. Australian news and updates here. Engaging political shenanigans, but not a patch on Francis and Claire. 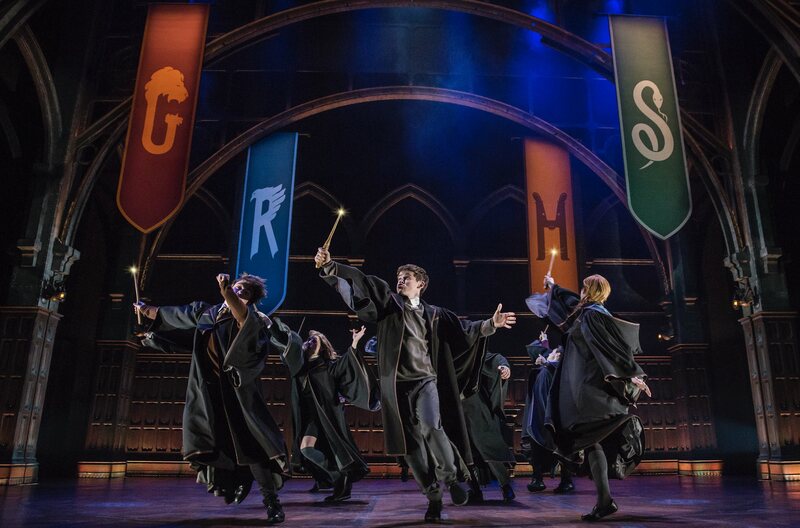 Harry Potter and the Cursed Child will have an exclusive season at Melbourne’s Princess Theatre in early 2019.